Iván Werning’s chaotic workspace exposes an unchained passion for economics. Iván Werning, AM’99, PhD’02, isn’t sure how old he is. “34? 33? I’m horrible about this,” he says (he’ll be 35 in June). Werning doesn’t lose himself in life’s details, like his age—or wedding rings. His ring won’t stay on the proper finger after he lost 50 pounds in the past year. It still fits on the middle finger of his right hand, and what if he gains back the weight? MIT macroeconomist Werning calls economics an addiction. What preoccupies Werning is economic theory. Complex equations for a paper on tax theory cover a whiteboard on one wall of his office at the Massachusetts Institute of Technology, where he is a professor of economics. The paper was submitted months ago, but Werning can’t get to the board to erase it—chairs, boxes, and stacks of the detritus of his research block his way, so he’s using another whiteboard for his latest work. That near-obsession with economic thought (Werning occasionally refers to economics as an addiction) has catapulted him into elite company. In December the Economist tabbed him as one of the world’s top eight young economists—perhaps the most promising macroeconomist. The magazine called him “an economist’s economist; an elegant theorist, whose early contributions provided streamlined proofs that other thinkers could make use of.” For instance, Werning and Chicago’s Robert Shimer have shown that lengthier unemployment benefits do not stop jobless people from wanting to find work. Also, with Harvard professor Emmanuel Farhi, a former student of Werning’s who’s spending the winter and spring 2009 quarters at Chicago, he has argued that taxes on inheritances should be progressive, and that governments should in some cases subsidize inheritances for children who aren’t born into wealthy families. Werning wasn’t the only U of C economist on the Economist’s list. 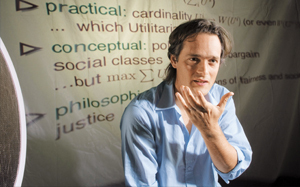 It also featured Jesse Shapiro, an assistant professor at the University of Chicago Booth School of Business; Roland Fryer, who as a postdoctorate fellow worked with Gary Becker, AM’53, PhD’55, and economics professor Steven Levitt; and Xavier Gabaix, who spent the 1999–2000 academic year at the University. For Werning a career in economics was almost inevitable. As a child he lived in Hyde Park, attending the William H. Ray Elementary School while his father, Pablo Werning, SM’76, worked toward a Chicago PhD in mathematics. His father tended house in the summers for Arnold Harberger, AM’47, PhD’50, who taught Latin American finance and, along with Milton Friedman, AM’33, shepherded “the Chicago Boys,” a cadre of young South American economists who helped shape economic policy in several Latin American countries, notably Chile, where they instituted reforms like eliminating trade barriers and privatizing state-owned industries. Economists were frequent guests at the Werning home both in Chicago and when the family moved back to Argentina, where cycles of hyperinflation and currency devaluation have made economics as much a staple of daily conversation as the weather. Fellow Argentines would expect Werning to be a Chicago Boy, he says, but he doesn’t fit the mold. For one thing, his theoretical work is more accepting of government intervention than that of the Chicago Boys. For another, although he thinks creatively about economic policy, for now he has no interest in setting policy. His model is more like that of advisers such as Becker, who have never been active public servants but whose ideas shape public debate. Werning himself has been absorbed with bridging the ideas of two giants of economic thought, Frank Ramsey and Sir James Mirr­lees. Ramsey, a contemporary of John Maynard Keynes, developed seminal ideas on the most effective ways for nations to invest its income to maximize economic growth. Mirr­lees won the 1996 Nobel Prize in economics for, among other things, work on how to create tax policy when individuals can report incomplete or false economic information to revenue collectors. Werning’s work with Farhi on inheritances, for instance, applies Mirrleesian models to tax policies.